A good teacher will guide, show and answer all your questions. It is a nice feeling when you have the correct answers and the right direction, then every step we make we improve ourselves. A good teacher is like a compass and leads you in the right direction. As we keep practising our Taijiquan太極拳 we progress from Level I to Level II. We become softer loser and our movements look more like Taijiquan. 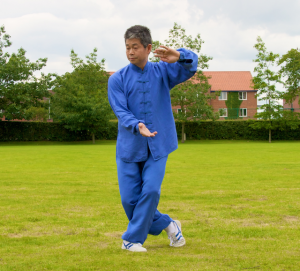 Although there are five major styles of Taijiquan they all follow the same principles. It is just like English, different people may use it slightly differently and have different accents, but the words and grammar are the same. You cannot however call a different language English, just in the same way you cannot say different movements are Taijiquan. So a good teacher will lead you to the next level, but this is still a low level as there is still a lot of stiffness. It is still 80% stiffness and only 20% soft and gentle. If we practise Tui Shou 推手, at this level, we will easily be pulled and pushed off balance, as our seniors will be able to use our stiffness to control us. This means we still need to practise to get rid of our stiffness and progress to the next level.